GDP Growth Disappointing. GDP growth was only 1.2% in the second quarter of 2016 and in fact has now averaged only 1.2% for the past year, much lower than the 2.1% average growth since the end of the Great Recession in June 2009. Consumers Spending Money. Consumer spending was up 4.2% in the second quarter continuing a long term trend. This means that there is plenty of demand for new products in the economy. 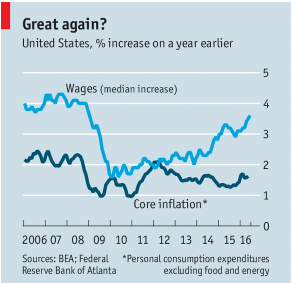 Wages Rising More Quickly. Total compensation is not only rising but the wage and salary component, not counting benefits, is up 2.5% over one year ago. This means that consumers have more money to spend. Investment Shrinking. Investment in new business structures, equipment and intellectual property has now fallen for the third consecutive quarter. Eventually, if not turned around, this decrease in new investment will lead to fewer jobs and less consumer spending. Poor Productivity Growth. Labor productivity fell .6% in the first quarter of 2016, a continuing slide. 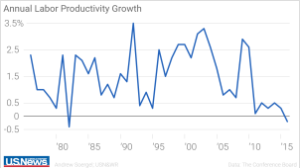 Weak productivity growth is a grave threat to long term prosperity in the U.S. Conclusion. Wages are going up and consumers have money to spend. But worker productivity can only increase when business makes new investment. This is not happening nearly fast enough. The House Republicans have an excellent plan to encourage business investment. Is either presidential candidate paying attention to this opportunity to speed up economic growth? I, for one, am waiting to find out! 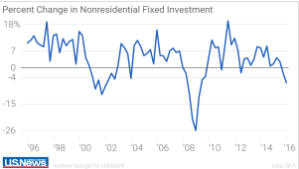 This entry was posted in consumer demand, economic growth, Economy, Jack Heidel, Neil Irwin, New York Times, productivity and tagged consumer demand, economic growth, economy, jack heidel, New York Times, productivity by jackheidel. Bookmark the permalink.